DEP Service Line Protection Programs – Is it worth it?? It’s time to pay your water bill and there it is again – that “sign up today” letter from the DEP. The letter then goes on to explain that NYC homeowners are completely responsible for paying for any repairs to damaged water or sewer service lines that run from their homes to municipal services lines in the street. The repairs are not covered by homeowner insurance policies – and they are expensive ($3,000 – $5,000 for water lines, and $10,000 – $15,000 for sewer lines.) BUT the city is here to help. 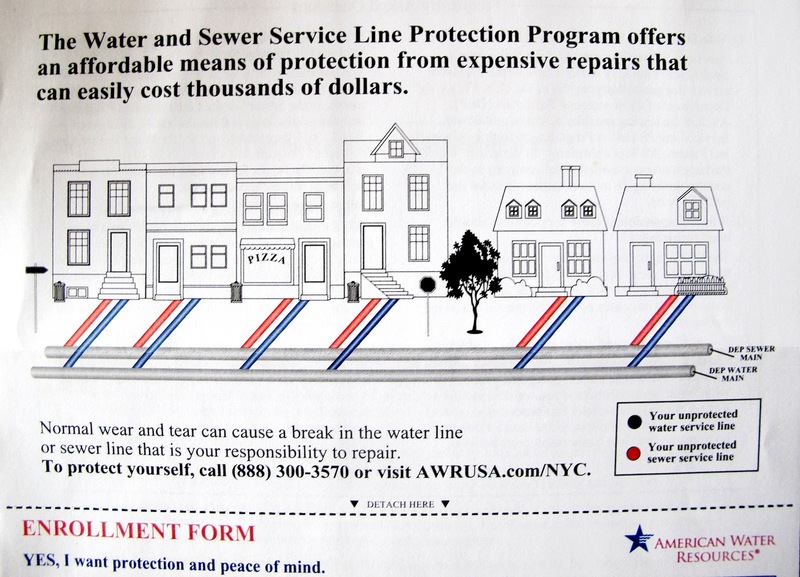 For $4.78 a month you get protection for your water line and for $8.70 a month you get protection for you sewer line. It sounds nice, only a small fee conveniently added to your already increasingly expensive monthly water bill. You may not even notice it. But really, it adds up. In a year that tiny monthly fee will have cost you $162. In fifteen years, it will have cost you almost $2,500 – and that’s not adding in probable rate increases. SO, is it worth it?? The Protection Plan is provided by American Water Resources (AWR). The company has been around for a while, providing similar protection plans to homeowners in Long Island and other parts of New York State for over 10 years. AWR was also hand selected by the New York City Water Board. In 2012 the Board issued a Request for Proposals from qualified providers for service line protection programs. “After a thorough review,” AWR was awarded a contract to administer the service line protection programs. The company has an A+ rating with the Better Business Bureau. The level of service is outlined and guaranteed by the city, not the company. Furthermore, the rates for the program are determined entirely by the City Water Board – not the company . Since neither will be receiving any revenue from the program, there’s less of a chance of shady rate increases. Repairing anything not resulting from normal wear and usage. Repairing anything caused by You or any third parties. Repairing anything caused by natural acts or disasters, such as earthquakes, floods, hurricanes, landslides or sinkholes. SO the program only covers line damage due to “normal wear and usage.” This type of damage may be cause by tree roots, rust, erosion, etc. This type of damage generally happens at the end of the life expectancy of your pipe line – about 40-70 years. SO public roadways and sidewalks are covered under the program. Private landscaping, walkways and driveways are not covered, but will be backfilled and covered with an asphalt patch. Water line: So the cost for repair, if you shoot for a cheap one is going to be about $3,000. If you pay $4.78 a month, it will take about 52 years to have paid $3,000 to the plan. SO, if your pipe needs repair within 52 years, you will be saving money. Sewer line: So the cost for repair, if you shoot for a cheap one is going to be about $10,000. If you pay $8.70 a month, it will take about 95 years to have paid $10,000 to the plan. SO, if your pipe needs repair within 95 years, you will be saving money. I’d say, DO IT. Unless you know your pipe is relatively new, I believe this plan is worth the money and the peace of mind. Pipes do not last forever and will at some point need to be replaced. If you own a home in NYC, you have a lot invested in it – you want to protect it, even on into the future. You’ve probably pictured what will happen to your house in the next 50 years. Don’t let an expensive flood of sewage and water be a part of that picture.